PETALING JAYA: Overall price appreciation for residential properties is expected to range between 5% and 10% this year, according to CIMB Research. In a report, the research unit said residential properties’ price appreciation could be even higher but it believed that the Government would continue to remain vigilant on “runaway” property prices. CIMB Research said in terms of house price appreciation, despite the slower real GDP (gross domestic product) growth projection of 3.8% compared with 5.1% in 2011, it believed that 2012 would be another good year due to several factors. “Buying momentum continued to be strong, driven by inflationary fears. “Supply growth should remain depressed as developers have only just started to focus more on affordable homes costing not more than RM500,000 in the Klang Valley. 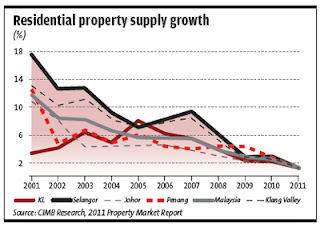 CIMB Research said although the residential property market would continue to set new records in 2012, it was expected that there would be a slowdown in the increase in overall transaction values in 2012 after two years of high growth that averaged around 30%. CIMB Research noted that in 2011, the growth of residential property supply in Malaysia fell to 1.5%, which was the lowest on record. The slowdown in supply growth was most pronounced in the big three markets (Johor, Penang and Klang Valley), which recorded an average growth of 1.2%. The only states to buck the slowing trend were Terengganu, Kelantan and Perlis. It was noted that major developers such as SP Setia Bhd, UEM Land Holdings Bhd, Mah Sing Group Bhd and UOA Development Bhd were all gunning for sales records this year and growth rates ranging from 10% to 35%. It was also pointed out that the risks to CIMB Research’s volume and price projections for 2012 included the global economic outlook and the local stock market performance. However, CIMB Research is not optimistic about the commercial property market in the Klang Valley as oversupply will plague the sector for many years to come. It noted that occupancy rates for the office and retail sector had started to drop. Meanwhile, future supply of hotel rooms (under construction) in the Klang Valley is likely to depress occupancy rates in the coming years. According to CIMB Research, UOA Development would be the biggest winner in a Klang Valley property boom as the company has no exposure elsewhere. The research unit is also optimistic about the prospects for Johor, particularly Nusajaya, as 2012 would see the completion of various catalyst projects. CIMB Research maintained its “trading buy” call on the property sector, but pointed out that property stocks could be sold down heavily in the event of an unfavourable general election outcome. Record breaking: Out of the 180 units of Sky Habitat released for sale, 125 units were sold. 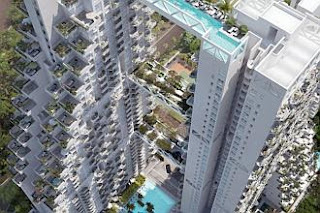 Eighty-three per cent of the buyers were Singaporeans who intend to live in the units. SINGAPORE: It may be Singapore’s most expensive suburban condo, but more than 100 units of CapitaLand’s Moshe Safdie-designed Sky Habitat in Bishan were snapped up on the first weekend of its launch. Out of the 180 units released for sale, 125 units were sold last Sunday. Eighty-three per cent of the buyers were Singaporeans who intend to live in the units, said chief executive of CapitaLand Residential Singapore Wong Heang Fine. Average prices range from S$1,747 per sq ft (psf) for a one-bedder to S$1,642 psf for a four-bedder. This works out to S$1.11mil for a 635 sq ft one-bedroom unit. Visitors at the showroom told The Straits Times they were attracted to the design and location, despite the pricing and it being a 99-year leasehold project. There was even a buyer, a sales executive who wanted to be known only as Danny, who toured the showflat only after he had bought two three-bedroom units - on the 33rd and 35th floors. The 32-year-old, who intends to rent out both units, added he had “not 1% of regret” about his purchase after visiting the showroom. Public servant Patrick Bay, who bought a two-room plus study pool-facing unit, said he was drawn to the project’s unique design, especially its “iconic structure”. “The price is steep, yes, but it’s comfortable with the incentives given,” Bay, 35, said, referring to the 3% early bird promotion. He intends to live in the unit with his wife for “at least 10 years”, and is confident that the value will be higher if he eventually decides to sell it. Ku Swee Yong, chief executive of International Property Advisor, said the sales figures were a “very good achievement”, given that the average valuation of other 99-year leasehold condominiums in Bishan is between S$1,000 psf and S$1,200 psf. But he had expected more robust sales given the initial hype. Meanwhile, new private home sales in the city state powered past the 2,000 mark again in March, just shy of February’s equally robust numbers, setting the stage for a record quarter with sales in the three months alone eclipsing even that of some full-year tallies. Developers sold 2,393 private homes last month - slightly down from February’s 2,417 units - as the blistering pace of sales continued unabated in light of the flush of liquidity in the market and low interest rates. This brings total sales in the first quarter to a record 6,682 units - even more than the number of homes sold in years such as 2009, 2003, 2004 and 2000. Experts say that the unusually high number of launches boosted sales as Housing Board (HDB) upgraders and local investors entered the suburban market in droves. Including executive condominiums, a hybrid of public and private housing, developers sold 3,032 homes last month. KUALA LUMPUR: LBS Bina Group Bhd is looking to sell up to 100% of two companies involved in golf club operations and property development projects in Zhuhai, China for an estimated HK$1.65bil. LBS had on Wednesday signed a signed a memorandum of understanding (MoU) with Hong Kong Stock Exchange-listed Jiuzhou Development Company Ltd's unit to dispose of up to 100% but not less than 60% equity interest in Dragon Hill Corp Ltd.
LBS managing director Datuk Lim Hock San said the MoU provided for the parties to negotiate exclusively with each other and finalise the scope and terms of a sale and purchase agreement. The MoU will kick start negotiations for Jiuzhou Development's unit Jiuzhou Technology Company Ltd to acquire Dragon Hill, which through its two subsidiaries, own and operate the 36-hole Lakewood Golf Club and its adjoining property development project in Zhuhai. Property developer, LBS Bina Group Bhd, is expected to reap RM650 million from the proposed sale of its China project. In a statement, LBS said its wholly-owned subsidiary, Intellplace Holdings Limited, today signed a Memorandum of Understanding (MOU) for the sale of the group's equity in two of its companies involved in golf club operations and property development projects in Zhuhai, China. The MOU was signed with Jiuzhou Technology Company Limited (JDX), a wholly-owned subsidiary of Jiuzhou Development Company Limited (JDCL), currently listed on the Hong Kong Stock Exchange. The MOU will kick start negotiations for JDX to acquire up to 100 per cent (but not less than 60 per cent) stake in Dragon Hill Corp Ltd, which is a wholly-owned subsidiary of Intellplace Holdings Limited. Dragon Hill, through its subsidiaries, own and operate the 36-hole Lakewood Golf Club and its adjoining property development project in Zhuhai. The proposed sale to JDX is worth up to HK$1.65 billion and will be settled by payment in cash, equity shares in JDCL, convertible securities and/or other means which shall be mutually agreed by the parties. "The proposed sale is a win-win deal for the parties. Further updates will be provided when there are material developments," Lim added. KUALA LUMPUR: IGB Corp, the third-largest property developer by market value, plans to raise about RM700mil by selling shares in a retail property trust, said two people familiar with the matter. The trust may list units in the second half of the year here, said the people who declined to be named as the information is private. IGB appointed CIMB Investment Bank Bhd, Credit Suisse Group AG and Hong Leong Investment Bank Bhd as joint global coordinators for the initial public offering, according to a Bursa Malaysia filing. IGB is taking advantage of a stock-market rebound that pushed the benchmark FTSE Bursa Malaysia KLCI Index to a record earlier this month. Felda Global Ventures Holdings Bhd, Malakoff Bhd and Gas Malaysia Bhd are also planning stock sales, after the value of equity offerings in the country slumped to an three-year low in 2011. IGB Managing Director Robert Tan couldn't immediately be reached for comment. Reuters reported on March 22 that IGB was seeking to raise RM600mil to RM700mil through the trust listing, citing an unidentified person. Plantations owner Felda Global may have a market capitalisation of about RM21bil after its IPO, Mohd Isa Abdul Samad, chairman of parent company Felda Holdings Bhd, said on Feb 14. IGB's trust would initially hold two Kuala Lumpur shopping malls the Gardens Mall and Mid Valley Megamall which IGB would acquire from its subsidiary KrisAssets Holdings Bhd. Mid Valley Megamall is home to 420 outlets, according to KrisAssets' website, while The Gardens houses 200 shops including department chains Isetan and Robinsons. IGB's offering comes after Pavilion Real Estate Investment Trust, another Kuala Lumpur shopping center owner, raised RM710mil in an IPO in November to become the country's second-biggest property trust by market value. It overtook CapitaMalls Malaysia Trust, a unit of Singapore's CapitaLand Ltd, which raised RM852mil through an IPO in 2010. CYBERVIEW Sdn Bhd, the landowner and developer of Cyberjaya, expects to attract some RM3 billion worth of investment into the global MSC Malaysia Cybercity hub this year. Cyberview managing director Hafidz Hashim said it had attracted some RM3.2 billion investments from various sectors last year. "There is a strong interest from multinational companies (MNCs) and local firms to set up their operations as well as global service centres in Cyberjaya. "The global service centres, which are being set up by the MNCs, for example, will be able to create thousands of high-end jobs," he told reporters after the signing of a memorandum of understanding (MoU) between Cyberview and Teknopark Istanbul. It was held on the sidelines of the Defence Services Asia 2012 exhibition here yesterday. Hafidz said that the company had justdelivered part of IBM's global centre. "Now we have over 620 companies, local and foreign, operating in Cyberjaya," he said. On overall development of Cyberjaya, Hafidz said as of end of last year, physical development of the land available to develop has reached 40 per cent, excluding those which are under construction and planning. ""If we include those (under construction and planning) which are expected to be realised within the next two or three years, we will be hitting 70 per cent. "By 2020, we should reach substantial development at Cyberjaya," he said. Hafidz said there is a few projects undertaken by private developers in Cyberjaya. "Based on our existing models, we do invite private developers and investors to take up parcels of land to be developed by themselves and they will then push their niche products to the market. "We have seen OSK, UM Land, Glomac, SP Setia and Mah Sing Group very aggressively putting up various parcels of development in Cyberjaya. "Most of them are built in phases over the next two to four years, depending on the size and scale of develpment." For Cyberview itself, he said it is very much involved in building public infrastructure amenities. The firm hopes to start the first phase of a residential development, especially for the middle-income group on a 100-acre (40.46 hectare) land, with a gross development value of RM900 million. KUALA LUMPUR: Ken Holdings Bhd will kick off its venture into hospitality industry with the development of 36 corporate suite at its Ken TTDI project, according to chairman and managing director Kenny Tan. “Hospitality is closer to our core business and it will also help the company to generate recurring income for the group. We have earmarked some land for corporate suites in our existing project in Taman Tun Dr Ismail (TTDI),” Kenny said after the company AGM. Executive director Sam Tan said Ken Holdings was starting its hospitality venture with corporate suite but would be building a “green hotel” in Penang in the future. However, he did not disclosed details of the proposed hotel. Kenny said Ken Holdings had invested RM120mil for Ken TTDI project which would also feature grade-A office space, banking hall, food and beverages outlets, banquet halls and performing arts theatre among others. Ken TTDI is expected to be completed in 2014. He added that company intended to acquire more landbank going forward. He said Ken Holdings still had a balance of 60.7ha to be developed. Sam said Ken Holdings would improve its financial performance steadily to ensure continuity and sustainability. He said the company had been growing “slow and steadily” over the years. He expects its financial performance to show an improvement this year boosted by new properties launches such as Ken Rimba Jimbaran. For the financial year ended Dec 31, 2011, Ken Holdings posted a net profit of RM23.2mil on revenue of RM87.1mil. To a question on its stocks liquidity, Kenny said the company was a “stable company with zero gearing and lots of cash in hand”. Sam said Ken Holdings was not a speculator and provided reasonable profits and returns to shareholders. KUALA LUMPUR: Engineering specialist Ken Holdings Bhd will branch out into the hospitality sector with its upcoming Ken TTDI (Taman Tun Dr Ismail) commercial development. The project is due to be completed by 2014, Ken Holdings chairman K.C. Tang said. The company invested RM120 million in the project. It will consist of a combination of corporate suites, grade A office spaces, banking hall, art gallery and various food and beverages (F&B) outlets, among others. The 36 corporate suites will be leased out to get recurring income, he said, adding that the suites are designed to be user-friendly. Ken TTDI is targeted to achieve multiple platinum rating in Green Building ranking and also MSC status. Tang said Ken Holdings' construction division will be more focused on developing its own projects instead of bidding for new ones. "Construction and property development is the best combination for us at this moment," he said. Executive director Sam C.S. Tan said there will be other property projects launched this year. These include Ken Rimba Jimbaran, which comprises 168 units of larger double-storey homes, slated to be launched in the third or fourth quarter. Another project will be Ken Rimba Legian, part of Ken Rimba development in Shah Alam, Selangor, scheduled to be completed by the second quarter. These projects will boast of "green" terrace houses. "In Malaysia, we have to deal with heat. We're going to try to make the homes cool by themselves so that buyers don't have to use much of airconditioners or fans. "We will have drain water housing tanks for all our terrace houses," said Tan. Speaking on the demand for "green" homes, he said, it has so far been very encouraging, adding that the level will increase once the projects are completed. "We are the pioneers in this (green homes) with our Ken Bangsar high-rise residential as well as Ken Rimba landed residential and Ken Rimba Commercial Centre," he claimed. For the year ended December 31 2011, Ken Holdings recorded an operating revenue of RM87.2 million and profit of RM23.2 million. The stock gained 1 sen to close at RM1.31 yesterday.